This site presents a selection of the experimental data acquired and analysed by the Borexino collaboration over its 10-year-old history. You can browse through each category for a general overview or directly go to the post related to a specific Borexino publication. Feel free to comment or to ask for clarifications. 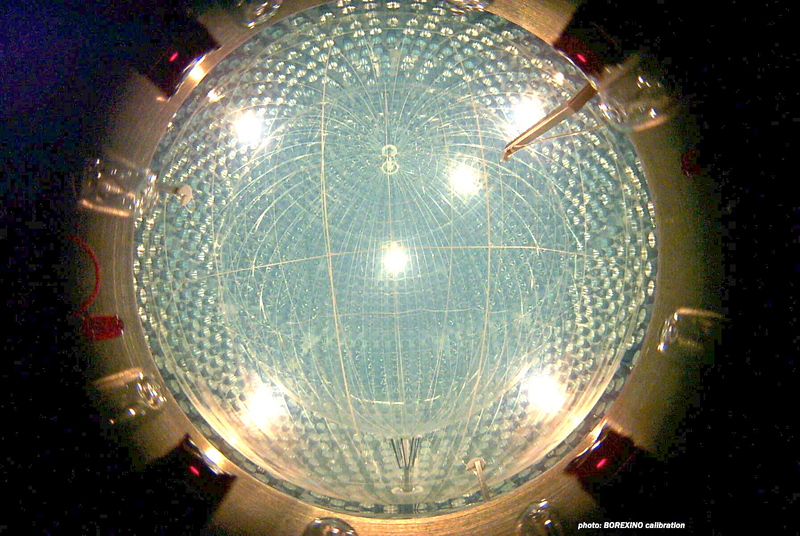 Borexino is a particle physics experiment located in Hall C of the Laboratori Nazionali del Gran Sasso, approximately 150 km north-east of Rome, Italy. It is a large liquid scintillator detector whose main goal is the study of the properties of low energy solar neutrinos and started data-taking in 2007. The exceptional levels of radiopurity Borexino has reached through the years, have made it possible to accomplish not only its primary goal but also to produce many other interesting results both within and beyond the Standard Model of particle physics. United States (Universities of Princeton, Hawaii, Massachusetts Amherst, Houston, UCLA and Virginia Polytechnic Institute).